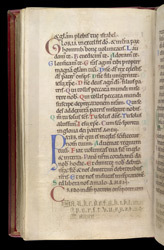 Medieval psalters could be used in church services as hymnals, or they could be personal prayerbooks. The Shaftesbury Psalter, with its relatively small dimensions, was in the second category. After the Book of Psalms, it has a series of prayers that the owner would have read from daily in personal devotions. This page has the Gloria, the Lord's Prayer and the Creed. In the lower margin, a later owner has added the alphabet, followed by "Amen." The alphabet may have served as a memory aid for a longer prayer.